The artist and activist discusses her ongoing Project 42—which memorializes murdered transgender individuals. This Saturday TEDxSeattle returns for its ninth year, featuring speakers like Amy Ansel (founder of Titan Bioplastics and Titan Hemp), Judy Twedt (a climate researcher, atmospheric scientist, and data sound artist), and Jono Vaughan—an artist, professor, and transgender activist. Vaughan’s major recent work has been Project 42, which takes its name from the short life expectancy of transgender people in the U.S. Each piece in the project finds Vaughan collaborating with another artist to memorialize a trans individual who was murdered. 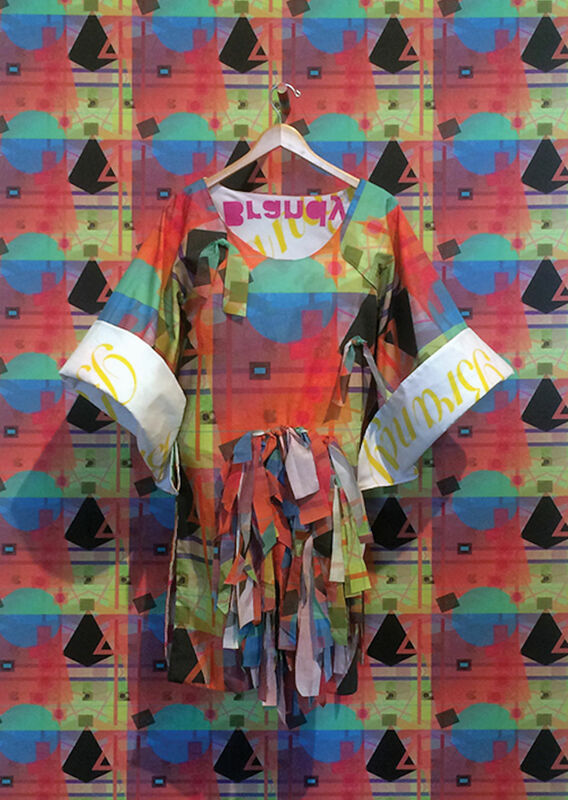 Vaughan takes a screenshot from Google Earth of the murder location and abstracts it into a beautiful, often fractal-like pattern, which is then made into a garment that a performer (often a dancer) wears. Pieces of Project 42 have been displayed at SAM, the Henry Art Gallery, and other locations. You can learn more and see videos of the performances here. Below, I spoke with Vaughan about this weekend and the project in general. I was hoping to start we could just talk about what your TED talk will be about. The talk is presenting information about Project 42 as an introduction to the piece we're debuting at the talk, which is a new memorialization action by Randy Ford, who will be performing in a new garment in honor of Tyra Trent. Tyra was a trans woman of color who was murdered in Baltimore, Maryland. So what I hope to do is take this opportunity to speak to give some idea about what I do as an artist, but also to create an introduction for a new memorialization and a new performance to honor one of the 42 individuals. One of the ways Project 42 functions is that any opportunity that I have like this where I've been given a platform—my goal is always to share that platform with the memory of an individual. So it's one of the ways that the project continues to grow. This opportunity, for instance, provided me with a chance to work again with Randy and collaborate with her on something that is really affecting her community, specifically, as a trans woman of color. So it's kind of a balance between my goal of talking and reaching people but also elevating the memory of Tyra, helping Randy to have a stage to perform on and to speak to a part of her community that I personally can't speak to as a white trans woman. I'm curious about why with this project in particular it's so important for art to interact with activism. I think there's a lot of political art but a lot of the political art I see isn't activism, necessarily, it's just engaged with political topics. Part of my goal for Project 42 is to create conversation. My community is a pretty small community. There's speculation that there's about 1.3 million trans people in America, but no one knows how many people there are. So I feel that a lot of times when I interact with people that I might be the first time they've ever interacted with a trans person. That's changing a lot but that's something that I've experienced. So the misunderstanding of who we are I think is built into the current political climate. And I think that with visibility comes oppression, because the more visible you become, the more people know that you're there, the more these spaces have confrontation. So trying to do something which is accessible, that's using beauty, using emotion, using a human action—I hope it creates a space in which people are able to let their guard down and contemplate what it means to the trans community that this violence is still occurring and doesn't feel like it's going anywhere. Last year was the most deadly year on record. This year there have been 22 murders. So trying to find a space in which everyone can connect to that. You know, people shouldn't be murdered for being who they are. Or, wow, this seems like a really complicated issue. This is more than just someone being murdered for being trans. Look at how many of these people are also people of color. This is also racism. This is also other forms of oppression. When you meet somebody who's dynamically opposed to who you are, what is it you can bring to them that makes them recognize the humanity you both share? That's a really big question. I don't really know if I'm answering it the right way in terms of the work but that's kind of the goal. I have always felt that if I put up messages that say things like Trans Rights Matter or Trans Rights Are Human Rights, then I'm putting up more of a wall than a window. There's nowhere for someone who's opposed to trans identities to step through and question and discover. Accessibility is really important to the work. And that's where the aspect of beauty comes in, because at first glance that's the most counterintuitive thing. You're taking these horrific acts and making them into beautiful pieces of art. Absolutely. That is the key component, but another component for me who is a contemporary artist who is white.... The majority of these people are people of color. I have to think specifically about how I want to talk about this problem. Because predominantly, about 90% of trans and gender non-conforming Americans that are murdered each year are people of color. So how to talk about this in a way that, yes, it's bringing people in but it's also not creating a spectacle of suffering. I wouldn't want to just make a painting of a murder scene. I want to talk about these issues but I also want to find solutions to them. I don't want to just put up an image and walk away. I want to present questions. This is happening and how can we address it? What can we do to put a dent in this violence? Beauty is a way to enter into this conversation. It's a little bit subversive. It's saying come look at this beautiful thing and while you're here you're going to discover that this beautiful thing has embodied within it this place where this murder took place. When I was at SAM, I was watching people interact with my exhibition, come up to my pieces, take their pictures with it, and they're smiling. Then they go read the didactic and their expressions change and they come back and they rereflect on what that thing is. I feel like that kind of talks about the way that our culture interacts with the trans community as a whole. That makes it—you touched on this—conversational instead of confrontational. Or it facilitates wanting to talk instead of wanting to argue? Yes, I hope so. I work with people who have connections within more conservative communities and they've said to me, "I've put your work out on my Facebook. And I get so many questions from people about why I would put this work up that at first looked like a fashion exhibition but was ultimately about this violence that occurs." So this one person in particular, she was encouraging her friends, without telling them what it was about, and then touching back later on and saying, “Hey what did you think about that show?” They were confused at first and didn't really know why she'd sent them there. And then they’re having this conversation about why does it matter, what does it mean. How can they as conservative individuals look at this from a different angle about human suffering and civil rights and equality? There was something in one of your artist statements about how you want to work in "active accomplice creation" instead of "ally creation." Can you explain that a little more? And also, it is my goal, and I've had these conversations with my collaborators—are you adding to this in any way that you might not be thinking about? Do you have a bias that you've not considered that might be adding to this. And that's really hard work for people who are allies to do. And I ask them to do all their own research. I give them the name and the location and they have to find all the research. I would hope they would do that anyway, but it guarantees that they are out there going deeper. They're going below the surface. I say things to my collaborators if they're not trans. Go read the comments. What do those comments say? What are the intersectional layers of oppression that you're seeing within this research? Do you think your work as a teacher has informed this project as much as your work as an artist? Absolutely. I like to call myself a teacher's teacher. I teach because I absolutely love to teach. I love being in the classroom. I love to engage with people. Perhaps in some ways the project started out too teacherly and I had to tone it back. But the assistants that I have that I mentor. Those assistants are former students. They come, they work with me in their studio. I'm constantly mentoring them on their work. And yeah, the opportunity to bring a little enlightenment to people is such an amazing privilege. Obviously I'd like to be paid a little more but it's a great opportunity to work with people in an relationship where people are willing to listen to you and you're willing to listen to them. I think that is really unique. There's lots of political things I could add. [laughs] But I won't. But I would like people to have an opportunity to look at some of the recent changes this administration is proposing. There was a brilliant article on [Monday] on Huffington Post from a trans woman in the state department. For 14 years she's been working in the state department and she's like, well, if I don't exist then all the treaties I've helped create—do those treaties not exist? I'd really encourage people to become knowledgeable about all the changes this administration is proposing that are going to affect trans individuals so dynamically. Updated November 15, 2018 at 7:30am to reflect Judy Twedt's correct title.